Rye, NY [February 20, 2014] Did you make any New Year’s resolutions for 2014? Is there still room for improvement? You are not alone. Like others, you may have discovered that lifestyle changes are more effective with small incremental steps. That is the idea behind the Rye YMCA’s 100 Day Step Challenge. Brainchild of Laura Tiedge, the Y’s Senior Director of Healthy Living, the step challenge is part of this year’s centennial activities for the Rye YMCA. With dozens of pedometers distributed to participants, the challenge is on. And if you prefer aquatics, then try a 100 miles in 100 Days Swim Challenge. Although both challenges started in January, new participants are encouraged to join anytime. The beauty of participating in the step challenge is that there is no wrong method to get and keep moving. It is truly self-tailored by individuals. The benchmark is 10,000 steps daily, which can sound daunting before you hear the many creative methods. Tiedge has created an online “community of walkers” to give participants a forum for sharing easy tips and personal successes, small and large. A big motivator for many is the regular email that Tiedge sends as friendly reminders, with links to articles and techniques. 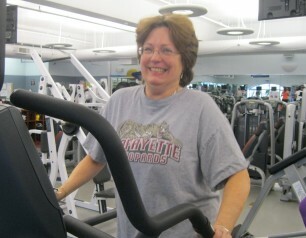 Rye Y member David Gammon was at 2500 steps by 2:00 pm on his third day of the challenge. 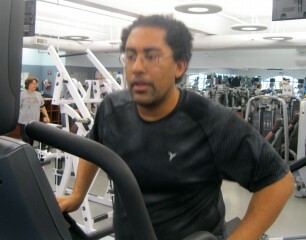 “I am just beginning my workout, so that should get me close to the goal,” he reported. “The program is increasing my awareness and giving more purpose to my workout.” He even finds himself walking more in the house. Another participant, Cadie Robertson, finds that quantifying her steps is fun. The first day she had 6400 steps without changing her habits. Bill Guyre is part of a team of five who are combining their efforts in the swim challenge. Guyre used to do his regular workout in the YMCA wellness center, but 6 months ago he decided to alternate this with lap swimming in the pool. “The swimming leaves me more refreshed and energized. It has improved my overall health and energy.” The team option has given him a convenient way to stay dedicated to the lap swimming. A few of the many approaches to success have included: adding distance to walking the dog, jogging in place (with arm motions from a shared article), going out dancing on a Saturday night, and a friendly intra-family step competition. To participate, stop by the Rye Y Member Services Desk and register. Participants in the step challenge can purchase a Rye Y Centennial pedometer for $10 while the supply lasts. Both challenges run until April 24.